The thickness (darkness) of the lines indicates the level of interaction. "Thicker lines represent more back-and-forth journal citations; thinner lines indicate less communication," according to the authors. What jumps out at me is that sociology has more strong connections than any other discipline. In other words, we listen to and are listened to by others in outside disciplines more frequently (although I'm wondering where the other natural sciences, like Physics, are). 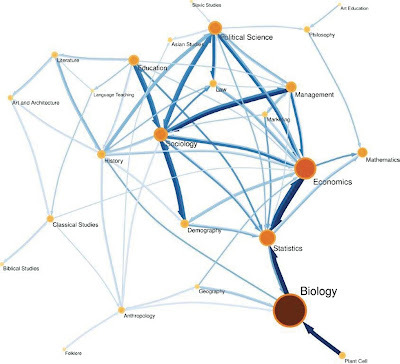 (From what I can make out from the chart, Economics has more connects  than Sociology , and History  ties Sociology, but neither match the number of intense ties.) I have yet to read the original paper, but it seems that sociology occupies a central node in the network. Go us! UPDATE: Fabio over at Orgtheory noticed this, too.